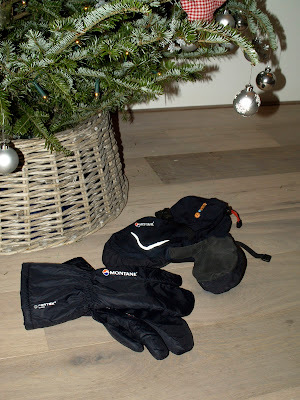 Imagine my surprise when I found a pair of Montane resolute mitts under the tree on Christmas morning. Ever since I saw them here I've been wanting a pair of these. WANTING you understand. Either Santa saw fit to grant my wish or he misplaced his own after taking them off to down the mince pie and glass of malt. I think the latter explanation is entirely plausible. Living at the North Pole I expect he knows a thing or two about gear for cold climates and these look like just the thing for high altitude winter slee rides! Either way, they're mine now, even if that means I'm off his list for next year. So what about the mitts? Well, first impressions are good. Very good indeed. "But", I hear you say, "at £70 a shot they'd have to be". And you'd be right too. So what exactly do you get for your hard earned? Well, for a start, you get four gloves and that's two more than you get in a standard cash for gloves transaction. Two of the four are lobster claw, pertex inners with heavy fibre pile insulation. Pertex/Pile, sound familiar? It should do, it's been around a long time! Buffalo clothing systems are built on the principle and anybody who's worn buffalo clothing will tell you it works. Pertex blocks the wind and the pile serves the double function of insulating and transporting moisture away from the skin. As long as you're active this stuff will still feel warm when wet. Still not convinced? I agree. 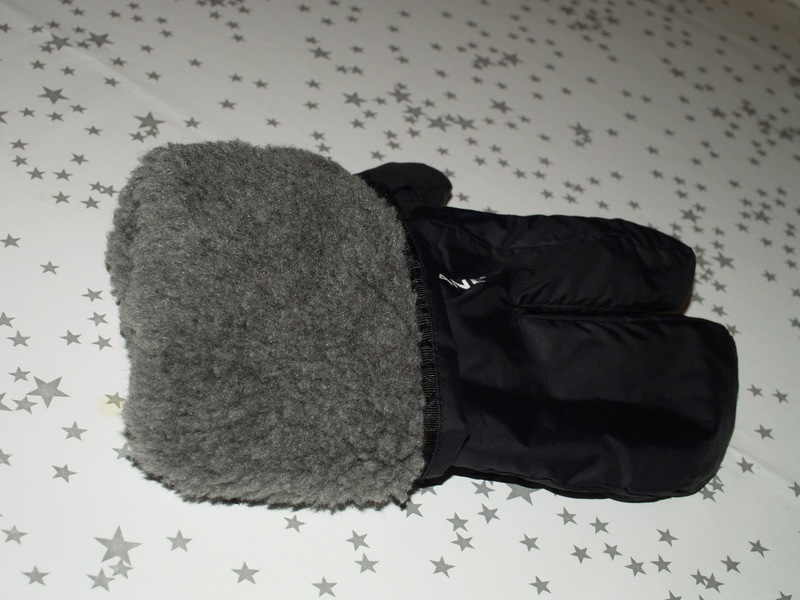 In principle that's not enough to command a market value of £70, you can get seven buffalo mitts for that ammount. So what else do you get? Well, the pile is heavier than that found in the iconic buffalo mitts and there are times when I, for one, will be happy with the extra insulation. You also get alien clawed loveliness. Don't knock it. It's not a gimmick. I think the trigger finger/lobster claw/whatever you want to call it is useful: for me more dexterity equals less excuse to strip my gloves to get things done and not having enough personal discipline to refrain from doing stupid things with bare hands in stupidly cold conditions may get me into (entirely avoidable) trouble one of these days. I need all the help I can get. Moving right along with the Buffalo comparsion you also get a better product. I love my Buffalos (I realy do) but there's no avoiding it, they're constructed using the simplest pattern concievable for a mit: two pannels joined with a single seam forming the main body and a thumb that sticks out of the side at an inhuman angle. There's nothing wrong with that, it works adimirably but there's a lot more work in the resolutes. The seams are gussetted , the thumb and trigger finger are where they should be and you get an elasticated wrist. I'm not sure that all adds up to better functionality but I think it probably will. At the very least the fit is better. “Okay, okay” I hear you say, “so the Resolutes are put togther better and are nicer to look at than the Buffalos but still, come on, £70 for a pimped up fibre pile mitt?” Again I'd have to agree, but then again I don't think you're paying for the inners. The other two mitts are, according to Montane, take a deep breath, fully taped eVent shells with hypalon reinforced palm, flocked microfleece nose-wipe, single-hand adjustable elasticated cuffs, locking wrist cinch, reflective trim and D-ring attachment points, breath again. That's not just a long list of technical features there's some useful stuff in there. First up the wrist cinch. Webbing through a ladderloc with a bite-down rubber end cap. Tightening and loosening can be done with a mitted hand or with the teeth. 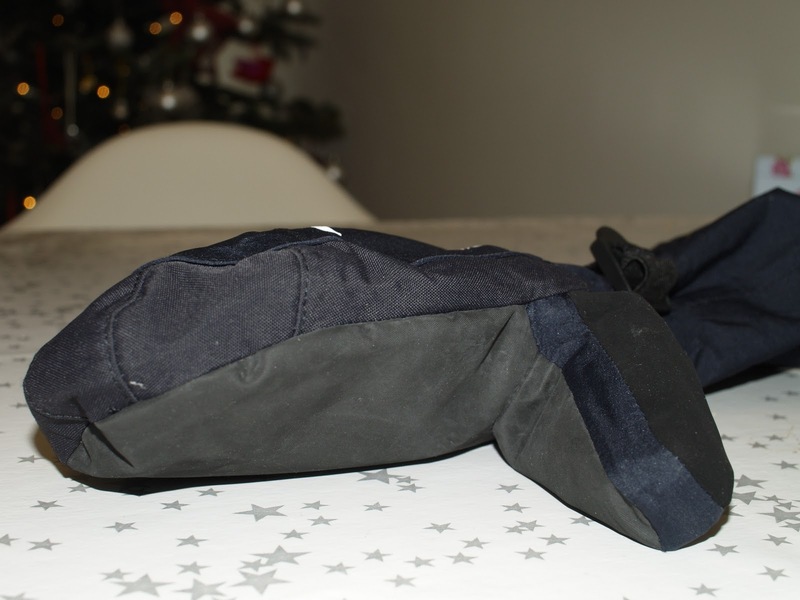 Next up the elasticated cuffs, with captive cord grip, can be operated with one heavily-insulated hand. It's hard to fault the moving parts and the pre-fitted D-ring saves me from adding one to attach the essential idiot cords. There are four materials used in the shell. The nose wipe is a fine microfleece, warm to the touch and no doubt easy on a much-rubbed red nose. Sounds disgusting I know but some sort of drip control is required when active in the cold and fumbling around in pockets for tissues isn't an option. Then there's heavy hard-wearing cordura in the gusset between front and back pannels and Hypalon on the palm and the working face of the thumb. Hypalon is a synthetic rubber more commonly used in the construction of inflatable boats and rooves. 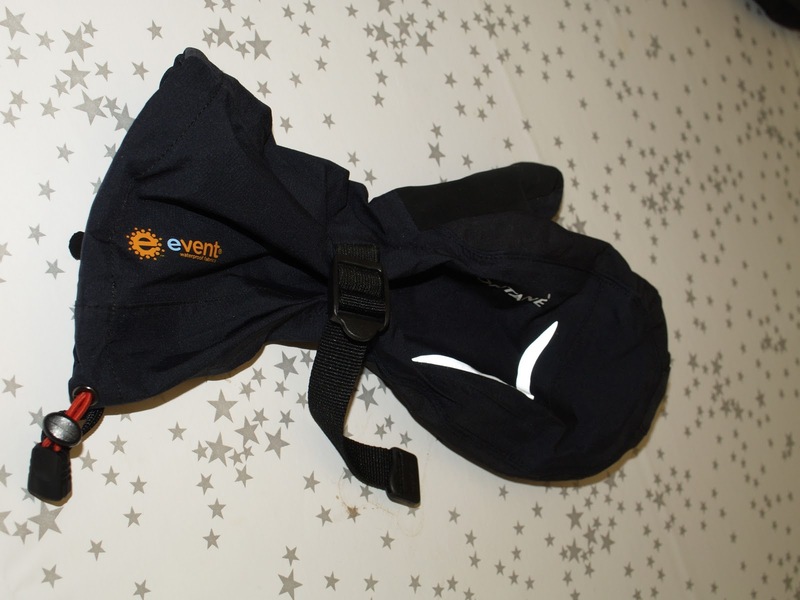 It's so applied because it can tollerate temperature extremes and UV light. I guess here it's a hard wearing layer that offers rubbery grippiness but I suppose the choice may also have been motivated by performance at low temperatures. The balance is 3-layer e-Vent hurricane which, if nothing else, is supple and looks realy nice. Like others I'm not entirely convinced by the requirement for waterproofness and breathability for normal use in cold climates and if I look criticaly at the use of e-Vent here I'm still not convinced about the breathability argument: the e-Vent is mainly on the back of the hand and around the wrist and the complexity of construction (I count 11 seams!) means there's a great deal of tape used. Nevertheless I'll be happy to have these shells on when the wind is blowing, during hand-to-hand combat with the white stuff when setting up camp and when using ski-poles (an activity that eats up more lightly constructed gloves). So are the resolutes worth £70? My conclusion is a resounding yes, to me they are. I think they'll prove to be a fantastic winter glove. I'd happily pay £50 for the shells and £20 for the inners is a more than reasonable price in the context of the price of a pair of buffalo mitts. My first impression is that these are well thought out and well made. They are also more than just an item of clothing they are the basis for a working system to keep my hands warm in different conditions and circumstances. I can of course now pair these shells with any other glove or mitt and on my next winter trip I'll carry the resolutes for camp duty and a pair of lighter gloves like extremeties thinnies for use when under way either on their own or paired with the shells. I'll let you know how it all works out when I know myself. An afterthought, just a closing remark about fit: I'm usualy a large (10 or 11 in glove size). I bought the resolutes in a large. The shells are perfect, roomy enough to swallow my hands dressed in anything from my current glove arsenal but any bigger and they wouldn't articulate well with my hand. The inners, however, are a snug fit. I'd preffer more space in the inners so that they could be paired with liner gloves and could be removed without stripping liner gloves from the hand. Large was on balance the right size for me but I'd recommend trying on a size up if there is opportunity to do so before purchasing. Also, for the gram counters: in a large the inners are are 52g, and the shells are 65g a piece. These are winter mitts! I just ordered a pair of these last week, so I'm pleased you gave them a resoundingly positive, and very thorough review/first look! As my long-term home is also the hometown of Santa (the whole North Pole thing is just a big lie to fool the kids) I am hoping that they will be warm enough when I'm out and about shovelling reindeer droppings off my front porch. I like the look of those Dave, I mentioned Lobster Claw mitts on someone elses blog recently. The price is fine if you consider that you're getting a pair of Pertex/Pile mitts as well as the shells. I picked up a pair of Lobster Claw shell mitts branded as Henri Lloyd but where to get lobster claw inner mitts for them I've no idea. I should've waited and got ones like yours. Good information about the sizing, ideally I like to be able to wear a liner glove (probably my BD Midweight) under the mitts, I also usually take a 10/11. Look forward to hearing how they perform. Mark: I've seen Santa in Rovaniemi but figured that was his holiday home :-) I'm sure you'll be pleased with teh resolutes. They're one of teh most convincing bits of kit I've ourchased in the last couple of years. Heavy and robust but they look like they'll last for years. Certainly just teh thing for reindeer duty. 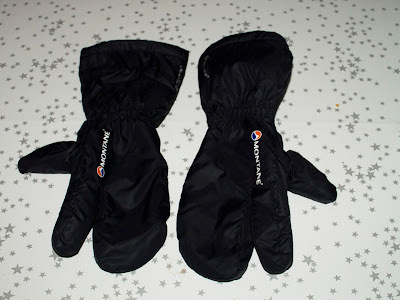 Mac: I saw that discussion it was over at Joe's blog when he reviewd the Montane extreme mitts. Also wouldn't know where to buy lobster-claw inners but I'm sure they're out there try looking at cycling gear, (e.g. swix, Toko, and Pearl Izumi) Cyclists like split mitts becuase they need to operate gear shifters. 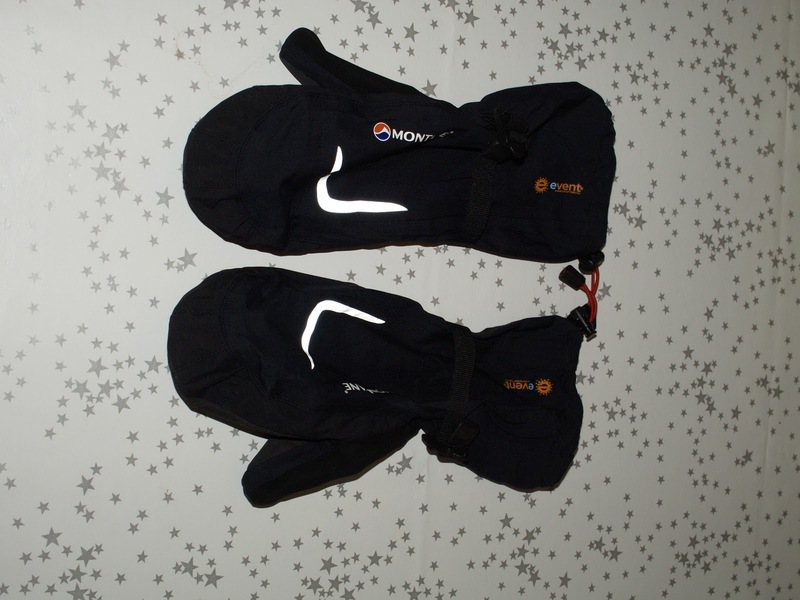 I'm realy surprised that Montane don't sell the Resolute inners and outers seperately. I think the shells especialy would sell if marketed as a seperate. The inners have some flaws, the biggest being the lack of reinforcment meaning they'll get beaten up if used for heavier work without the outers, but something more along the lines of the extreme mitt with reinforced palm would work well with the shells. The Resolute Liners but with the Extreme mitt palm. 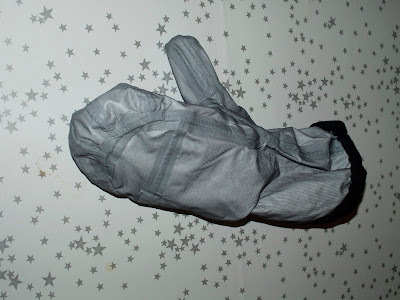 The Resolute shell but without the wrist strap (the cuff cinch is perfect and all I use on shell mitts). One thing I miss from my Rab gloves is some loops near the finger tips of the Inner and Shell so they can be clipped to a 'biner on your rucksack strap the right way up (so they don't fill with snow...). That you think there's a winner in there is quite something you being so picky about your gloves and all. Indeed I think montane are almost there, just a little selective breeding and they might just produce the master glove you've been searching for. I got mine yesterday. I agree they are a bit small for their ascribed size, but I think I can just about fit a liner glove in them. I'll give them a real test next week I think. Better snug than sloppy I think. I'm thinking the inners may stretch a bit with use. Enjoy!